Why is there a purchase limit on the antimatter crystals? Is there like a notification that pops up to let us know if 10 people completed the bounty mission, or do we know after the 8 hours is complete? I think there's a icon in the homepage, if you tap that, it will show how many member have participated so far. I triggered the first bounty and the purchase limit reset so I just think it’s more of a safeguard so you don’t buy more than one per 8 hour period, especially since you can’t obly trigger one bounty mission per 8 hour window. Do the alliance wide rewards scale with the number of participants above 10? e.g., do you get more rewards if 20 in the ally participate versus exactly 10? What is the proportional bonus reward the initiator receives? I started it the first time, but only got the 50 5* shards as did the rest of the alliance. Can a player who is not in any alliance play these missions? I hear the rewards are better for those who can do math. absolutly right. You nailed it. It looks like very much similar to me also. Peopele are doing math and posting as they recieved the rewards by simply calculating. But they missed some calculation, when our champs are stuck in AW we wont be able to cover all the instances. 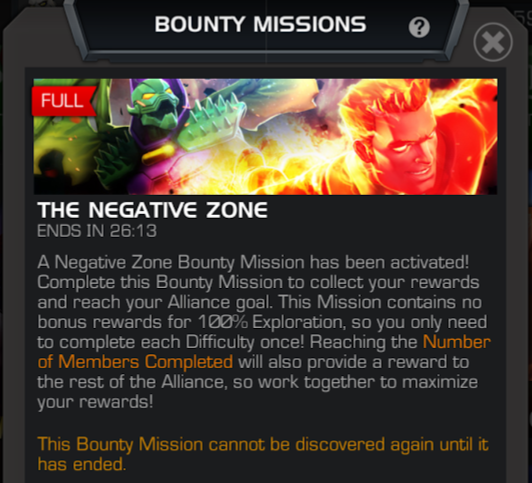 One question, what are the total rewards if I do all the missions of the heroic and the master of the negative zone? I'm not getting the epic. So far I have calculated best case scenario for Beginner, Normal, and Heroic. Will post Master in a short while. Are we going to be able to complete all difficulties or just one? And regarding these Antimatter Crystals... Will they only activate Bounty Mission or will they award some items along with it? If yes can you specify what exactly? You'll be able to do all Difficulties if you'd like! 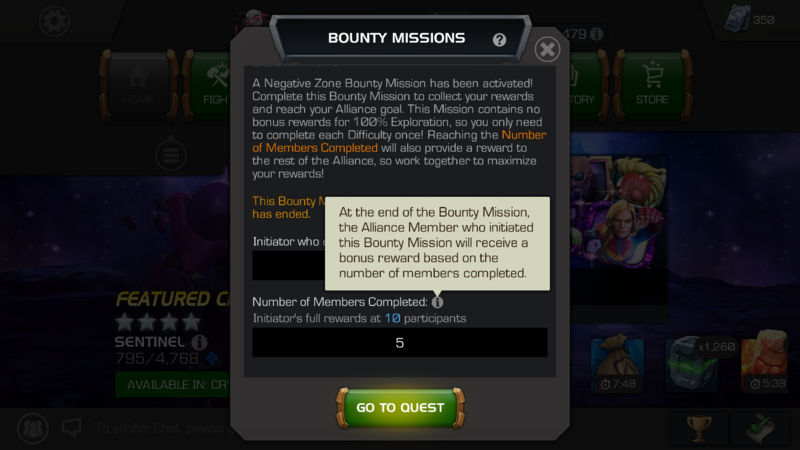 The Crystals are mostly to activate Bounty Missions, but will also award 1500 gold. Just a small amount of gold, but it's there. Just want to confirmed. Each participant is only required to do ONE difficulty to be consider participating in the event for the minimum of 10 members. Is this correct? Would be nice if the 5-Difficulty Quest screen would show some indication whether you completed that Difficuly yet. Like at least say “Completed” if you don't want to show the normal “33% Complete” type wording that would normally have been present (since you don't need to do 100%). Otherwise have to look at Quest Rewards screen beforehand, or actually re-enter quest and see if any solid lines, to remember which difficulties you’ve already done (or whether it’s actually a whole new 8-hour mission that is going on. I don't get what the 10 limit is for, is it just for rewards or is it a hard limit? In other words, does that mean after 10 people in the bounty mission have played it, then the other 20 people in alliance can't participate in the bounty mission, and must wait for the next one? In other words, does that mean after 10 people in the bounty mission have played it, then the other 20 people in alliance can't? People can still play it after 10, 10 participants is just the threshhold to trigger the bonus rewards. The word “Full” is probably a bad choice to have as a banner when it reaches 10 participants, maybe something more along the lines of “Goal Reached” or something. They way I understood it is that it is a minimum of 10 participants. The quest stays open after the 10 requirement is met so anyone in the alliance can still play them. Has anyone else run into an issue where the bounty was locked because it was "full"? An alliance member of mine tried to join one and got a message stating that it was full. So, I know 10 members have to join the bounty to get the bonus, but is it locked to only 10 members? Nope, I joined one just earlier that already reached 10 and said “full”. and if you have 10 members in the alliance compete in all bounty missions that would be I believe a total of 4200 5* shards which adding to the remaining for Maser(500 + 4200) you would have 4700. Agreed the banner of full doesn't help and Goal Reached would be perfect. Right, that is the confusing part. It says "FULL" right there. Thanks. Just unclear word usage on their part. Got it. Confused and looking to clarify, I am not in an alliance but have some antimatter from the EQ and calendar, when I go to the special tab in crystals however I do not see the option to use my antimatter, nor can I sell it or seemingly do anything with it. Is this because I am not in an alliance? I had read previously that In addition to triggering a bounty mission these anti matters awarded 1500 gold per, not much but I am still wondering, are they 100% worthless unless I am in an alliance? Quote... **They will be available between April 3rd and May 1st! You must be in an Alliance to trigger, or access Bounty Missions, and will have to update to the newest version of the Game! Although agree it did not mention whether or not you could still at least Buy/Open a crystal with it, just for the tiny amount of Gold in there. Probably not. But you CAN spend a couple Antimatter on buying the latest BEACON in Store. That's about all it's useful for if you aren’t in an alliance (suggest you just join some casual alliance that doesn’t require full AQ/AW). Perhaps I missed it somewhere but are the antimatter gonna be used for something else besides the antimatter crystals and to open bounty quests and the beacon? Seems like every alliance as a whole is gonna have quite the abundance of them if that is all they are used for. By the end of 4 weeks, yes, for most ppl. But at least initially here, and for those that are of the few people online during off-peak hours, they could be short Antimatter depending how often they have to be the ones to startup next 8-hour Bounty late-night or overnight hours. That's a legitimate question. Where are you @Kabam Miike ? ?